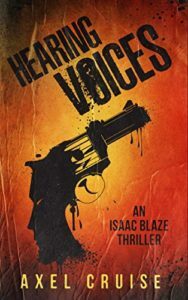 Hearing Voices is a different kind of action adventure novel as three people work together to save themselves, innocent people, and perhaps the world. While that’s not an unusual collaboration, in the case of Isaac Blaze, his two “partners” were in his mind. So the three of them (Isaac, a woman, and a man) team together to solve mysteries and almost as often, save themselves from certain death. I’ve seen others describe Mr. Blaze as a “Jason Bourne” character…okay but only from his physical abilities. Listening to the three minds talking as situations arise was priceless. I really enjoyed this thriller and look forward to the second novel. Do yourself a favor and read this book. This article was published on Aug 6, 2018 . It is tagged axel cruise, Hearing Voices, isaac blaze. You can follow any responses to this article through the comment RSS feed.